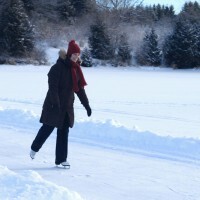 The large bodies of water at Island Lake provide ample opportunity for skating when the conditions are right. Over 1 km of ice is cleared on the main lake, allowing you skate along a trail, instead of circles. For a quick skate or a good game of pond hockey! The pond is cleared in a circular rink, this area is sunken and surrounded by trees providing a great windbreak. When Wolf Lake freezes over this area is perfect for skating! A large rink is cleared as well as a skating trail loop attached to take you further down the lake. Hockey nets are also located on the rink; however please respect the interest of all users.